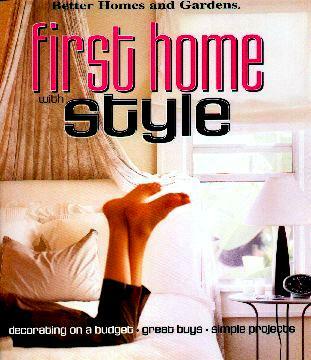 This is a very useful book with helpful hints for either moving into your first home or re-doing just one particular room. This Better Homes and Gardens book has covered all rooms to include your bathroom, office, bedroom, kitchen, dining room, and living room. Full of inexpensive and affordable ideas to transform any room you desire. Pretty stark in many instances which is fine if you're just starting out and don't have much. You can always accessorize accordingly. They give you hints on decorating plus "what you need" and "what you'll want" guides to assist you when choosing new goodies. I loved their idea on room arranging (little diagrams) to give one ideas of how to arrange furniture. Also, their extremely helpful and creative, and most importantly, inexpensive decorating ideas are found at the end of the book. People like me, with little to no style, need all the help they can get and this is a great aide. I loved the movable bookshelves on pages 179 and 181. My favorite rooms are the bedroom on pages 138/139, the office on page 175, and the kitchen on page 22 which could be brightened up with colored knickknacks. Conclusion - The perfect gift, and source, for anyone's first home or if you're moving or wanting to decorate just one room.